This fall started out very wet. It rained every day for almost two weeks. They say April showers bring May flowers and that is quite true. Yet chilly, rainy fall days bring cravings for comfort food. It’s time to change from grilling to low and slow cooking. A big pot of hearty soup or stew sure hits the spot. So I got out my Dutch oven and made Szegedinger Gulasch (German Sauerkraut Beef Goulash) to satisfy the first of many of my fall cravings. Beef stew is near and dear to my heart. It holds memories of my dad making it time and time again. 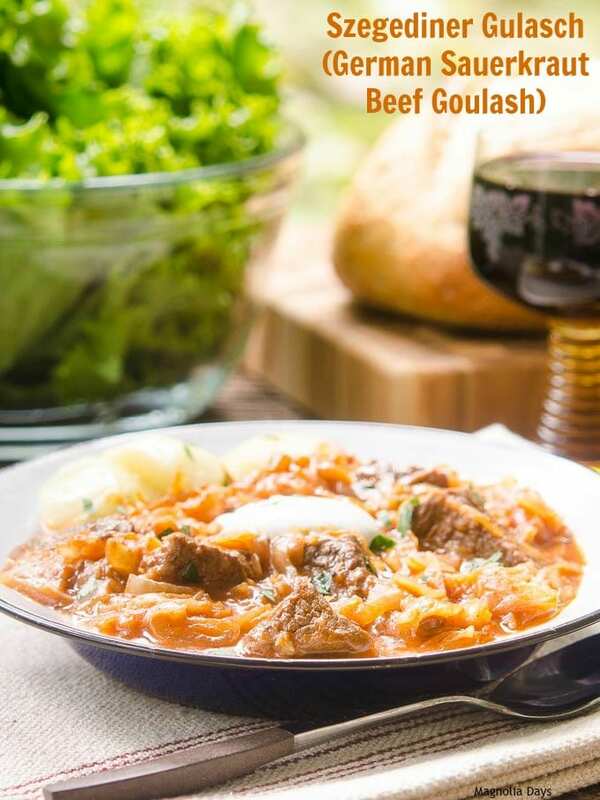 Goulash is a type of stew and it also reminds me of those family meals when I was growing up. 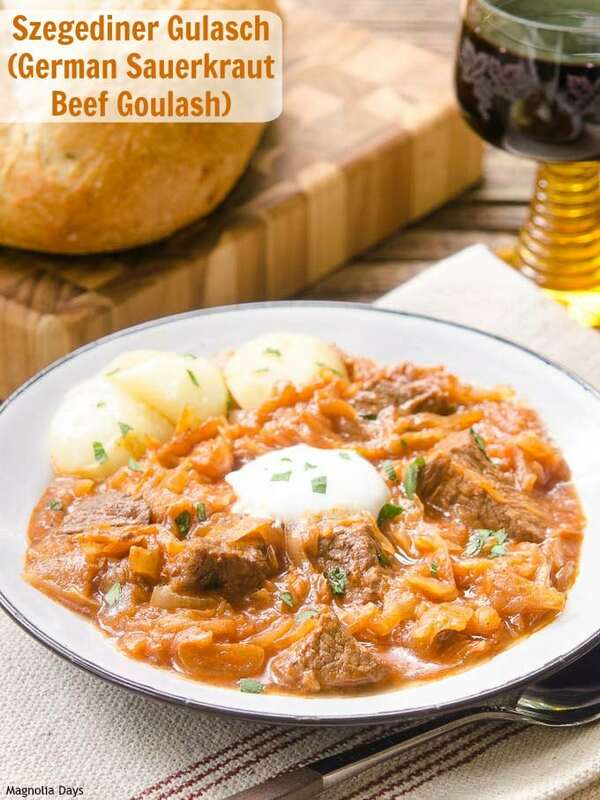 It’s my German heritage that kicks in because Germans sure do enjoy goulash. I saw so many variations of it in magazines, cookbooks, and restaurants while visiting there last year. Hearty can be healthy too. It all has to do with the ingredients and balance of a meal. Szegediner Gulasch is a prime example. It starts with beef as the base. Beef is a wonderful source of protein with essential nutrients to keep you satisfied and your body going. Then onions join in the pot adding their own vitamins and nutrients. Paprika is ground capsicum peppers loaded with Vitamin A, carotenoids, lutein, and zeaxanthin – all good for your eyes. Wine is good for the heart. A little of it along with beef broth, garlic, and tomato paste bring in more flavor and healthy goodness. Then sauerkraut, an uber vegetable, adds its classic and familiar tang. Why is sauerkraut an uber vegetable? It’s fermented cabbage. Fermentation produces lactic acid bacteria, a natural probiotic good for the digestive system. Szegendinger Gulasch is healthy comfort food. To round out the meal, a dollop of sour cream goes on top for a little dairy and calcium. Serve it with boiled potatoes or on top of spaetzle or noodles. A leafy green salad on the side is a bonus of fiber and even more nutrients. Oh, and whole grain bread is great to sop up every drop of the rich, tangy sauce. 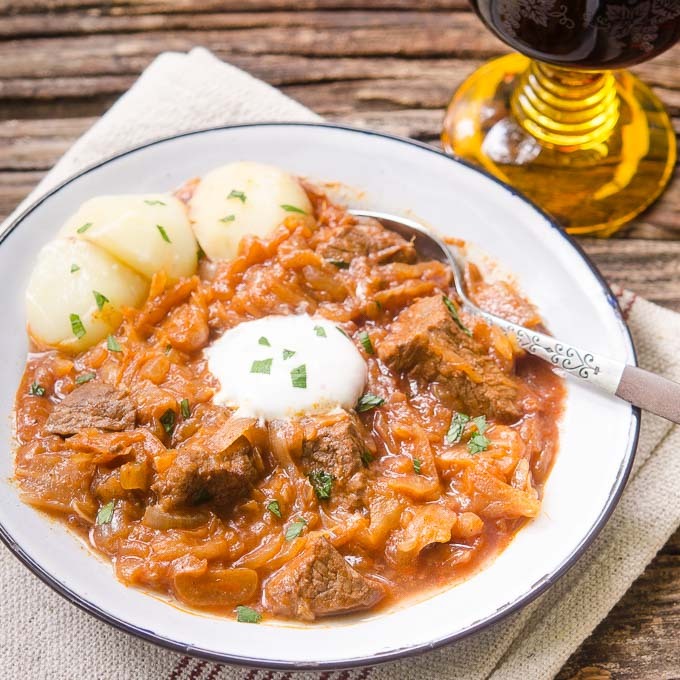 A note about this goulash: It originates in Hungary and is named after poet and writer, Josef Szekely. The Hungarian recipe calls for pork. 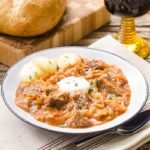 It has since become a popular dish in many European countries, especially Germany. Along the way the meat used in the dish varies including pork, beef, and veal. My preference is beef because I enjoy it so much flavored with paprika. Fall is a time for low and slow cooking. It also gives an opportunity to spend valuable time with family and friends while a meal is simmering on the stove. Sunday Supper has partnered with the Beef Checkoff to share recipes and show how to build a healthy plate with beef. Scroll down to find the list of them and each one is a click away. Also look at Cider Beef Stew, Boeuf aux Carottes (Beef and Carrots), and my Dad’s Beef Stew. More on The Beef Checkoff: You can follow them on Facebook, Pinterest, Twitter. You can also find lots of information, tips, and recipes on the Beef, It’s What’s For Dinner website. Take a look at the Healthy Meals with Beef Pinterest Board for more inspiration and recipes. Such a comforting bowl full of good-for-you stuff!I truly enjoy the German recipes you share, Renee! They are always filled with flavor and your beautiful photos make me salivate! Oh, boy, this would taste amazing over spaetzel! Pure comfort! I can’t wait to give this recipe a try Renee! I love sauerkraut too! I am making this sometime this week! Reminds me of when I was in Germany. This looks like such delicious comfort food! 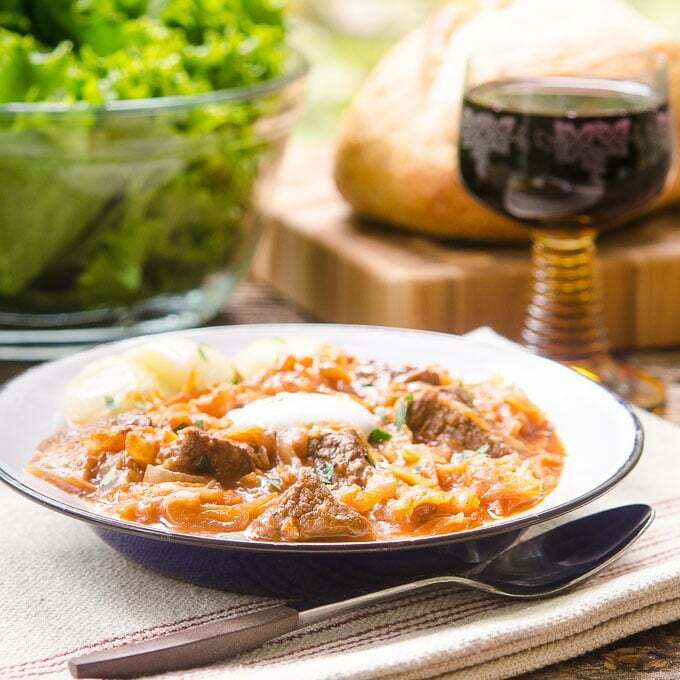 Leave it to you to take something like Gulasch and make it look absolutely gorgeous! WOW nt stomach just growled realllly loud. This looks gorgeous and sounds delicious!!! I want to try this first over potatoes! Yum! It’s actually named like this because of where it’s from, szeged. That’s why szegedin goulash. Anyways, great recipe. I make it all the time with different kinds of meat, boar, venison etc. Have one on the stove right now. I agree with the Szeged etymology for the name. Szeged is know for paprika. We had a family recipe that went by this name that was similar that came from my Czech grandmother. I prefer this with cracker dumplings, though the old Czech’s in the family seem to think this is heresy. Btw. this is not German food – its Hungarian food, one might move it up a bit to Austria, but Germany no way! Please do not call this a German recipe. It’s origin is Hungarian and (since there once was an Austrian-Hungarian monarchy), it was adapted widely in Vienna, Austria. That said, the recipe is fairly authentic.